Note: You can purchase Catholic Reference Books including a copy of the Catechism of the Catholic Church from the United States Conference of Catholic Bishops, USCCB. 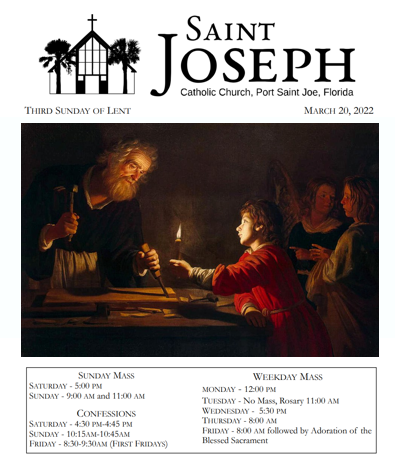 Celebrate Mass with us, check Mass times for Port St. Joe at St. Joseph Eastern Time Zone here. "After these things Jesus showed himself again to the disciples by the Sea..." (Jn 21:1). The Sea has often been a special place to encounter the Lord. Whether you are local, a seasonal visitor, or someone enjoying a weekend on the Gulf Coast, St. Joseph Parish is a place to encounter Jesus. Join us for Mass, Adoration, Bible Study, social events, or simply stop by to offer a prayer.